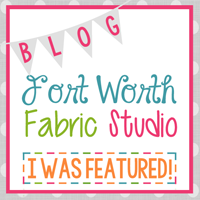 I had this big idea to take the scraps from the top of my mother's patriotic quilt and create a scrappy flag on the back, as I mentioned I was going to do on this post. To make a long story short, it didn't quite work out the way I had planned. A lot of it had to do with some of the fabric that I was trying to use. I had purchased the fabric years ago before I knew any better and quickly realized how cheap and horrible it actually was. I ended up tossing aside the horrible fabric and went and bought some Kona Navy to finish up the project. I also decided to keep the flag separate and create a wall hanging instead. My mother isn't one for flashy quilt backs anyway. So, without further adieu, here is my mother's wall hanging. There are 5 stars represent my mother's 5 grand kids. I used up every last piece of this fabric collection and I'm truly please with the results. For the quilting, I used a wavy stitch setting on my Bernina. It's just a additional touch to the flag to help give it some movement. My mother's patriotic quilt has about an hour worth of work left on it and then I will be finished with it. I promise to show it off when it's done. My brother's quilt is quilted and all I lack is burying my threads from the quilting and putting the binding on. I hope to have that done in the next couple of days. I have a nice 12-hour drive to look forward to for the holidays and I plan on hand-stitching the binding down to help pass the time. I hope all your holiday projects are coming to a close as well. Your patriotic quilt is wonderful! Love that the stars represent your mom's grandchildren. And Yay for projects to work on during car trips! What a sweet wall quilt! Thanks for sharing. It is quite touching to know the meaning of the 5 stars. This turned out fantastic. That wavy stitch is perfect for the quilt! Amazing. You are so talented. Your quilt is beautiful! I know you fought with that navy fabric for awhile. I'm glad you switched it for the Kona, since I know you wouldn't have been happy with it unless the fabric was "behaving." I love It! The scrappiness of it is so great! Absolutely beautiful! I have a grandson in the Marines and one who is going in next September ~ would love to do something like this for them. Thanks for the inspiration! Love this flag quilt! Beautiful! I love this! 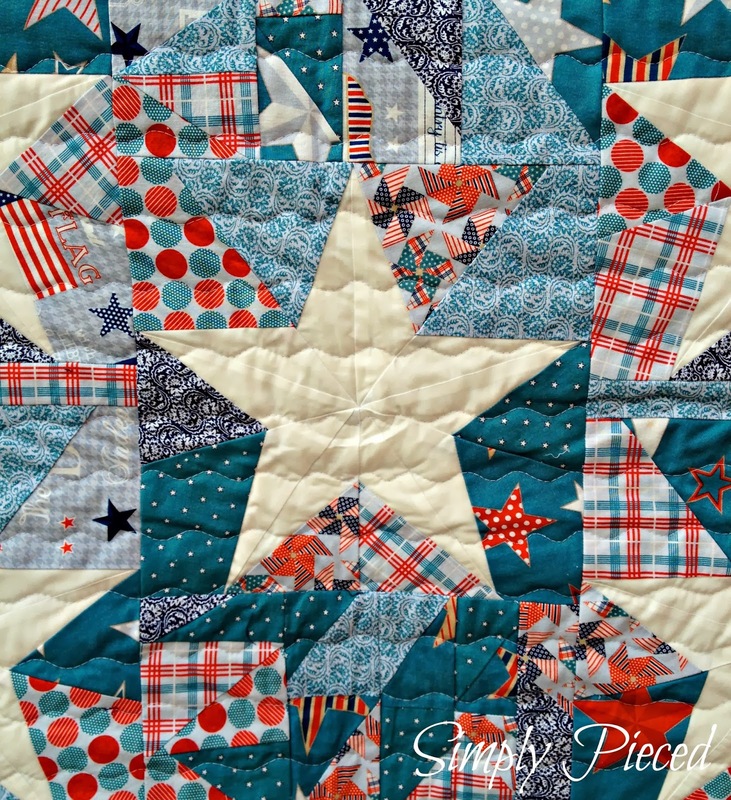 I have dreams of making a scrappy patriotic quilt, so it is fun to see the creations of others. It is wonderful! There's plenty of lovin' showing in that quilt. This quilt is gorgeous! Congrats. I really like thwack quilting, too! So fabulous. So scrappy. So full of meaning. good call on all those decisions you had to make! I think the wall hanging is cute. you are going to be so dang happy to have this done, aren't you? it's been a long time coming! This is brilliant! The scrappyness is perfect, not too much not too little! I'm sure your mother will love the quilt - it's beautifully done! Beautiful quilt and your mom will love it! Thanks for sharing. What a beautiful wall hanging! The quilting choice was perfect for a flag. 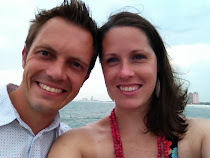 Thanks for linking up to Sew Cute Tuesday! This is just so fantastic! Extra beautiful in person! I need to make something like this for my grandmother...perhaps that is what I will do in the new year. What a beautiful quilt, the meaning is just lovely. Great wallhanging - and lovely quilting! Love the five stars idea in your flag quilt! I think you did a great job!! !